Round one of three in the Cooney Lees Morgan Lunchbreak Battle got underway last week, with 40 teams taking part in the inaugural event. 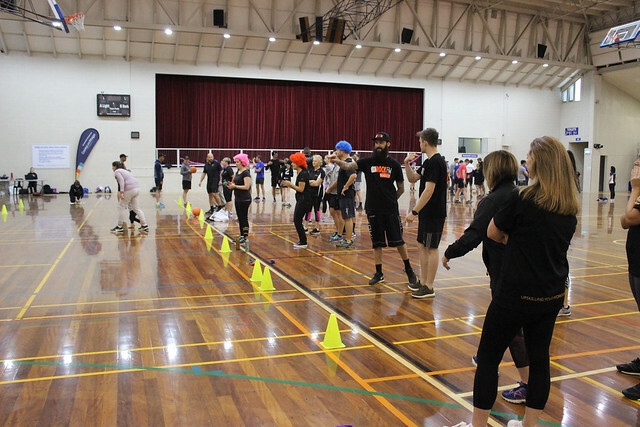 Hosted by Sport Bay of Plenty, the Cooney Lees Morgan Lunchbreak Battle is an annual free event designed to encourage Tauranga businesses to get out from behind the desk and get active for up to 45 minutes during their work day. Local businesses enter teams of three into the event, which runs over three consecutive Thursday lunchtimes, and go head-to-head with other organisations in a series of physically and mentally challenging games and activities. “With most of us spending up to eight hours a day seated – including during our lunchbreaks and when we get home – this event is a quick, easy way to break up the day, chat to your co-workers and even meet new people from other local businesses. Your bosses will thank us for it!” says Sport Bay of Plenty Recreation Advisor Michelle Barns. The Cooney Lees Morgan Lunchbreak Battle is at Queen Elizabeth Youth Centre, 11th Avenue on Thursdays May 24, 31 and June 7, starting at 12.10pm. The event comprises of three unique challenges: The Week That Was, Clash of the Corporates 2.0 and Curve Balls. There are prizes for podium finishes in each event, as well as overall top spots, thanks to our generous sponsors, including The Barrel Room, Barrio Brothers Tauranga, Rye Bar and Grill, Tauranga Musical Theatre, Escape Masters Tauranga and Virtually Reality Experience.